Origin’s upcoming free ‘On The House’ game takes us all back to a time before boost jumps and wall runs, casting you as a marine private fighting his way through some of the biggest battles of WWII, including Pearl Harbor, Guadalcanal, and Tarawa. Play the games in our picks of PC’s best free games while you’re waiting for it to land. Instead of being a lone soldier, the 2004 game has you fight most of its battles with a squad who gain experience through each firefight, becoming more effective as the war progresses. 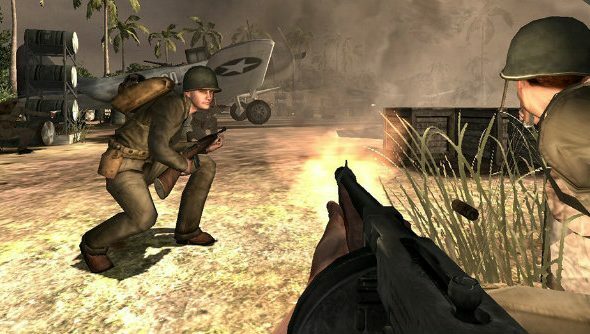 As well as the single-player, Pacific Assault did launch with a fully-fledged multiplayer mode. However, the online game services are no longer available, so prepare yourself for that minor disappointment before going in. It’s free, though, so you can’t really complain. The game, which is usually £7.99, is coming to the On The House promotion soon, although no exact date has been revealed. On The House only requires an Origin account, so sign yourself up in preparation if you haven’t already.